U.S. Secretary of State John Kerry gestures as he speaks during a visit to Expo Milan in Milan, Italy, Oct. 17, 2015. The stability of the world is directly linked to climate change and its impact on food security for billions of people, U.S. Secretary of State John Kerry said on Saturday. In a speech to the Milan Expo, Kerry argued that unrest tied to climate change induced agricultural failure poses an international threat. The Milan Expo in Italy is focused on food security, and Kerry urged attendees to act quickly against climate change. 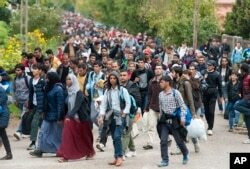 Kerry said it was "not a coincidence that, immediately prior to the civil war in Syria, the country experienced the worst drought on record", sparking the migration of some 1.5 million people "that intensified the political unrest that was beginning to brew". "I'm not suggesting the crisis in Syria was caused by climate change, obviously, it wasn't. It was caused by a brutal dictator who barrel bombed, starved, tortured, and gassed his own people. But the devastating drought clearly made a bad situation a whole lot worse," he said. Kerry described climate change as "threat multiplier". "Even if it doesn't ignite conflict, it has the ability to fan the flames and to make situations much more complicated for political leaders to deal with." Kerry cited the mass migration to Europe as an example of a crisis provoked partly by climate change — which he warned will get significantly worse if large parts of the world become uninhabitable due to global warming. FILE - Migrants walk along a street after they arrived by train in Hegyeshalom, at the Austrian border, 169 km west of Budapest, Hungary, Oct. 7, 2015. Kerry's call comes ahead of the U.N.'s conference in November aimed at securing a pact on greenhouse gases that would limit global warming to two degrees Celsius over pre-industrial times. The White House has made tackling climate change a priority, despite stern opposition from the Republican-controlled Congress. The last big push for a world climate deal was in Copenhagen in 2009. It nearly ended in a fiasco after rich and poor countries bickered over how to share the burden of addressing the problem. Kerry is in Italy on the first leg of a three-nation tour of Europe that will also take him to France and Spain.